Maybe you've got that bowl, that plastic pumpkin, that pillowcase of sweets. What do you do with the good stuff? Easy. Eat it. Duh. But what about the loser candy? You know, Smarties, Tootsie Rolls, generic suckers from the drug store. Eating that stuff just plain tastes like defeat. Like you lost a bet or something. Don't worry, friends. We're here to help. Lynne Rossetto Kasper is the host of American Public Media's "The Splendid Table," and she's offering tips on cooking with loser candy. Lynne Rossetto Kasper: Hello, John. John Moe: Candies are sweets. But many of these candies are gross. So, what can we do to make them better? Rossetto Kasper: Well, first of all you should know that if you take a Tootsie Roll, and you take Poppin' Fresh dough - you know, the rolls, right? And you stick a Tootsie Roll inside of that Poppin' Fresh before you bake it. You know the pain au chocolat, it's like a croissant but it has chocolate in the middle? You can create that. Moe: Pillsbury tube rolls and some Tootsie Rolls. Rossetto Kasper: You've got Tootsie Roll. Now, following the Poppin' Fresh concept, there is the Jolly Rancher Sunday biscuit. 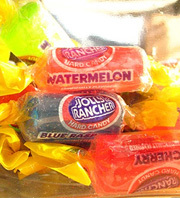 Now, this involves actually crushing the Jolly Rancher. And you use it in two ways. Half of it goes into the biscuit, that same idea - raw biscuit, stuff the center - but the other half gets sprinkled on the outside. And it caramelizes as it bakes. Moe: This is Sunday brunch. Rossetto Kasper: This is Sunday brunch, without a doubt. Moe: So, those are our sweets. Those are ways to re-channel our candies into new sweets that are, perhaps, not more delicious, but more intriguing. Rossetto Kasper: More intriguing. And I'd love to think more delicious as well. Moe: Well, can we go beyond sweets? Can we get into the savories? Rossetto Kasper: Now, this is where a great challenge comes along. But, one cannot resist. There is a universally loved flavor combination, that is sweet-sour. Right? It's the first thing you go to in any cuisine. Well, what I discovered was, you know, when you take a saute pan and you cook a chicken breast in it, or a piece of fish? And you get all those brown crusties? And, you know, recipe books tell you to put a little broth, maybe a little wine? I made one. And I brought you - now this is, this is really just wine, a little vinegar, and I threw in some Smarties and some suckers. I know it looks like heck, because some Tootsie Roll got in there as well, but you don't have to do the Tootsie Roll. Moe: Ok. I'm going to try this. Rossetto Kasper: Try this now. Moe: You know - oops, I'm dripping. It has the notes of candy in it. You can taste the candy. But you forgive the candy's presence. And, you got a nice little sweet and sour sauce. Rossetto Kasper: Now, you put that over a piece of grilled fish. And they will come. And they will eat it. Just don't tell them what it is. And now, my favorite is mini-dinosaur eggs, which you can serve all through the holidays as hors d'oeuvres. And this is borrowed from a very famous caterer in New York. They used to take goat cheese, which they would pack around a grape. Well, we're not going to use a grape, we're going to use candy corn. And then you take Jolly Ranchers or lollies, you know, lollipops. Crush them, because they're sparkly and you know, they're crunchy. And you roll these little tiny, sort of mini-dinosaur eggs in that. And you get a, you get an experience the likes of which no one will have had at any time at any holiday party. Moe: Well, it's kind of a moment of adulthood, isn't it? Because you have this sort of sentimental, take-you-back-to-childhood candy corn, but look - I'm mature, I'm eating goat cheese. Rossetto Kasper: Exactly. And by the way, the children can make these. And it may introduce them to a wonderful cheese. Moe: Now, can we transcend food entirely? Is there anything else we can do with it? Rossetto Kasper: Yes. All you need is Elmer's glue and any surface you can imagine, ok? Because, I think one of the things that's been seriously overlooked - and any five-year-old is going to tell you this - these are art project materials. Now, I mean, Christmas decorations? Take any kind of torn up cardboard, paint it on both sides, and then everybody in the family makes their own mosaics. So you can do suckers that stick out like a, you know, a sundial. You could do anything you want with the Tootsie Rolls. I mean, they could be standing up like little missiles. And then you can just put a hole in the cardboard and hang it on the tree. Moe: You can make Tootsie Rolls look attractive. Rossetto Kasper: Yeah. In fact, if you do a Tootsie Roll on end, glued to the cardboard, with two pieces of candy corn laid flat on top of it, so they look like they're going off in two different directions, you can actually receive messages from Mars. Moe: Lynne Rossetto Kasper from the Splendid Table. Thanks, Lynne. Rossetto Kasper: It's been fun. Thank you, John. Instructions: Heat the ingredients in a skillet until the lollipops melt. Stir and serve. Try it with fish or chicken, just don't tell your guests the ingredients. Instructions: Stuff the dough with tootsie roll. Follow baking instructions on the can of dough. Viola! Instructions: Form jawbreaker-sized chunks of goat cheese packed around candy corn. Crush the Jolly Ranchers or lollipops (if you want to take out some frustration, Lynne suggests using the back of a frying pan to do the crushing). Roll The cheese covered candy corn in the hard candy sprinkles. These could make a great holiday treat and could give the kids something to make! I agree, Alan. Tootsie Rolls satisfy my sweet tooth better than chocolate! I am writing to defend the honor of Tootsie Rolls and Smarties. These are not in any way "loser candy". Just to confirm this, I asked my six-year-old and he said that he loves those candies and I could not have the ones that he got this year.